I tend not to go for realism in painted art. Or gentleness. I’m not one for brushstrokes so fine you can barely see them or dainty flowers executed in delicate pastels. I can appreciate the skill level involved – let’s face it, it far exceeds my own! But it’s not me, it’s not a type of expression that resonates for me. I like vibrant colour – the colours of a fiery Autumn. Visible brush and knife work. Something that looks like it’s been painted in broad sweeps or splashes or speedy dabs. Texture. Something that evokes rather than depicts. I’m my father’s daughter in much of this – I have his liking for Matisse, his preference for something a little bit dramatic or quirky, not photographic, executed in strong colours. Maybe a surprise or two. I like Afremov‘s evocative paintings of autumnal city evenings, warm and inviting, the kind of aloneness that makes you feel alive rather than lonely. I like images that evoke fire and wood, nature and humanity at its most dramatic and powerful. Abstract concepts and executions. Boldness with a side order of mystery. Elegance leavened with quirkiness. Warmth that entices and encourages but doesn’t coddle. If art expresses who and what you are, I guess I just told you an awful lot. And because Pinterest is a better medium for conveying art – this is the art that speaks to me. 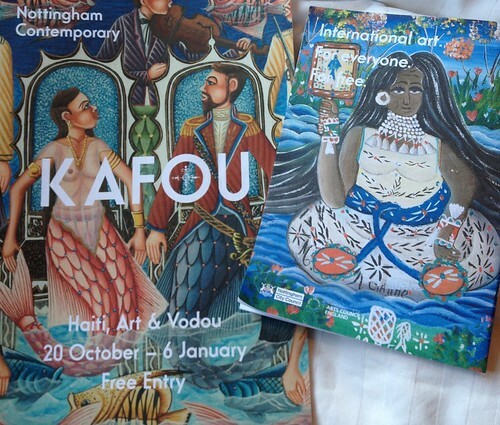 On Friday, I spent a fascinating couple of hours checking out the latest exhibition at the Nottingham Contemporary – Kafou. Out of all of the exhibitions I’ve seen there since this fantastic and much-to-be-recommended space opened I reckon this one was the most up my alley. Kafou is a celebration of Haitian art, in which themes of Voodoo rituals and the Haitian revolution recur as frequently as the gloriously vibrant colours that make the word ‘celebration’ seem more appropriate than it often is when used in the context of art exhibitions 😉 There’s some dark stuff there, none of the artists featured are likely to delight fans of the literal and the photographic, and despite the best efforts of the exhibition notes I’m sure I didn’t get all of the symbolism (though a surprising amount of it will seem oddly familiar for those of you who have read Pratchett’s Witches Abroad! ), but as a fan of colour and symbolism I found it largely both beautiful and fascinating. It’s not just painting, though that forms the bulk of the exhibit – there are also some gloriously rough-at-the-edges sculptures, some stunning and vast beadwork scenes for the textiles fans, and a few original, suspiciously torn and stained, ritual cloths. One thing that utterly charmed me was the few parents and grandparents that I saw taking quite young children round (I’m guessing they didn’t dwell on the one or two rather surreal depictions of devil-related nightmares!) and really encouraging a completely natural appreciation of the work. I love art (though I can’t for the life of me draw or paint – that seems to be a ‘one per generation’ thing in my family, and my sister nabbed it! ), but like literature it does tend to suffer a bit from people wanting to over-analyse and over-dissect. It pays, I think, to consider themes and symbols and metaphor, but I can’t help feeling that the people who focus on a particular brushstroke (or sentence, if we’re talking literature) to the Nth degree are in danger of losing the impact of the whole while they peer at the detail trying to figure out the artist’s putative intentions – because so much of any artistic expression is in what feels right. So, you can see why there’s something rather magical to me about children simply being encouraged to put into words what’s made them light up or step back to take in a picture properly. It’s tapping into their instinctive appreciation, getting them to put into words what a painting has made them feel, what’s caught their eye. What The Artist Intended can come later, after the connection with the work has already been made. I’m not saying that analysis is bad – far from it! Having an idea what the artist was working towards or focusing on while working helps to inform your appreciation of the work, cultural context helps decode things you otherwise may have missed, and semiotics is a fascinating study in itself and a rich seam to mine when studying any piece of art or literature. But these things aren’t to be used to carefully take apart a creation and view it piece-by-piece – I much prefer to think of them as aiming to augment my understanding of a work as a whole. They create the nod of recognition, the smile at an in-joke that personalises the piece a little more for you. The close-up study helps – but you do need to remember to read to the end and consider your impression of the novel as a whole, or to take a few steps back and view the painting from a distance. I guess you could say the same of a lot of elements of life. Enter your email address to follow this blog & receive email notification of new posts.